Cats are notoriously fussy pets. Some like to roam free outside as much as possible, whereas others prefer the creature comforts of home. However, even the most home-loving of cats can like to go outdoors now and again. This can be a concern as these felines can be inexperienced in dealing with the dangers that being outside can pose – in particular, roads, dogs and other wildlife. 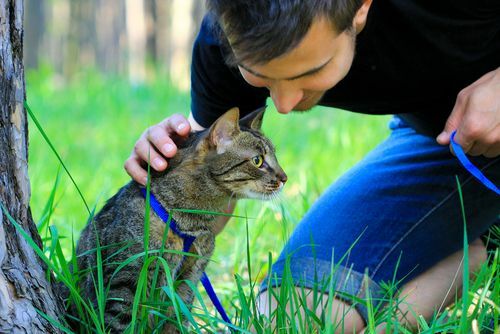 Leash training is a great way to get your cat used to being outside. Fresh air and exercise will help to keep her healthy, and this activity can also reduce boredom-related behavior problems. It is also a good temporary solution for cats that wish to go outdoors, but are too young to have been spayed and you are concerned about them becoming pregnant. Cats should never be walked on leashes that are attached to collars. Not only could they damage their neck if they pull or jolt too hard, but they can easily slip their collars and run away. And most cat owners know that a can on the run is virtually impossible to catch! Instead, cats should be walked using a leash attached to a harness. Although most cats can be trained to wear a leash, kittens are naturally more accepting of wearing a harness. You should ensure that the leash attachment is on the back of the harness rather than anywhere near the neck. The first step is to get your cat used to the harness. By leaving it near your cats usual resting spots or where she eats, she will soon get used to the sight of it. Hopefully your feline friend will go over and check it out by sniffing it. If she does this, it’s a great sign! Reward her how you usually would (treat or play time) and she will soon make a positive association with the harness. Cats are creatures of habit, so it may take multiple attempts to get your cat comfortable in her harness. Distract her with treats and slowly start to put the harness onto her, one shoulder at a time, giving her time to get used to the way that it feels. Continue distracting her with treats and attention and after a few tries, you will hopefully be able to get the harness in place and secured. Once the harness in place you will need to practise adjusting the fit. A good indicator that it fits well is being able to get two fingers between the harness and your pet’s body, but no more and no less. If your pet is happy in the harness, give her a treat and praise her for her behavior. If she protests, or seems anxious or stressed then distract her and remove the harness, and try again another time. Once your furry friend is happy and comfortable in her harness, it should be simple to attach the leash and start practising walking around your home. Guider her gently by exerting a slight, persistent force on the lead. Reward her when she follows to encourage her that she is doing the right thing. If your cat hasn’t ever ventured beyond the boundaries of your home, then the world may seem an exciting but scary place. She will be easily startled and may be hesitant to move at all. Your first few walks might only be to the end of your driveway until she gains confidence, but you should always go at your cat’s pace to allow her time to build up her picture of the environment around her. Gently encourage your cat to walk a little further every day if you can. If she holds her tail up, that’s a sign that she is feeling confident. Walking a cat is a lot different to walking a dog. While dogs like to sniff everything, but are quite happy to walk a relatively long and designated route, walking a cat is much more like a meander of exploration. They might like to stay close to home and just explore the immediate area, or they may want to venture further afield, but wherever they are, they will likely check out everything in the vicinity before moving on. With time and careful training, you will soon have your feline companion happy to walk on the leash.